Matthew Daniels is an English colonel who has been sent home from the Crimea in disgrace. 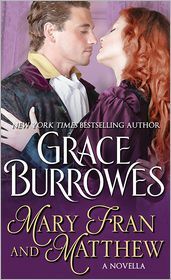 Mary Frances MacGregor is a Scottish widow who loathes everything about the English military, and yet both Mary Fran and Matthew know more than they want to about being lonely and isolated, even amid family. They yearn to understand each other too, but old secrets and divided family loyalties threaten to cost them their chance at shared happiness.